Little Elgin Marble-esque of us, isn’t it? Forgery = bad. Duh. I would love to know why we’re hanging on, and I’d love to know the reaction to the protest. Still some good, juicy stuff to come out of this story for sure! That’s certainly one unique way of protesting although I don’t think anyone would complain about the chosen method. I absolutely love that protest! Not sure if I could participate, but I would so love to be a part of something that beautiful in the name of art. The forgery isn’t even close to the original! that seems a bit odd to have kept the painting. i wonder if it’s hanging “for safe keeping” in someones office? they really need to return it, i mean they’ve been sentenced, case closed, yo. i wish i could be one of those women. 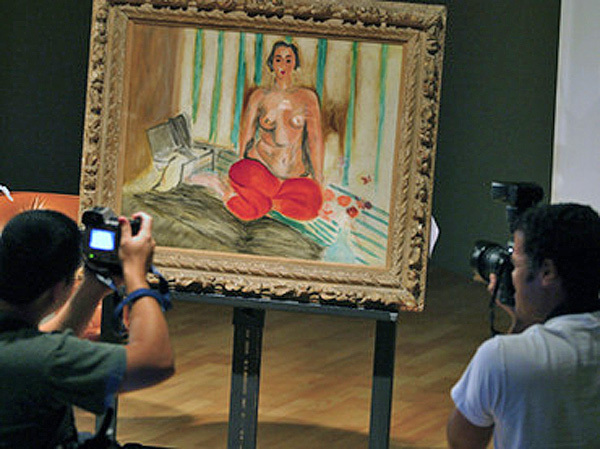 not that i want to hang out in red pants and my tatas, but just the fact that they can do that for the sake of art. that that is an option in their brain is pretty cool. i love that painting, it’s so lovely.